If you feel like there just aren't enough hours in the day to get everything done, you're not alone. That's so obvious, right? It's the understatement of the year. The fact is, most people today are feeling overworked and we're more stressed out than ever. In a recent survey, 87% of people said they're overworked, 30% of them by five or more hours per week. It seems that when it comes to work-life balance, we often don't even feel we have a choice. With so much work to do, it's inevitable people feel their personal lives suffer. It makes finding some kind of balance even more important. Glassdoor, that site you might have used during salary negotiations to see what your contemporaries are making, recently identified the careers in which people experience the best work-life balance. “By maintaining a healthy-work life balance, we see employees who tend to be satisfied in their jobs and motivated to work hard and be productive, which helps them avoid burnout,” Scott Dobroski, Glassdoor’s community expert, told Business Insider. 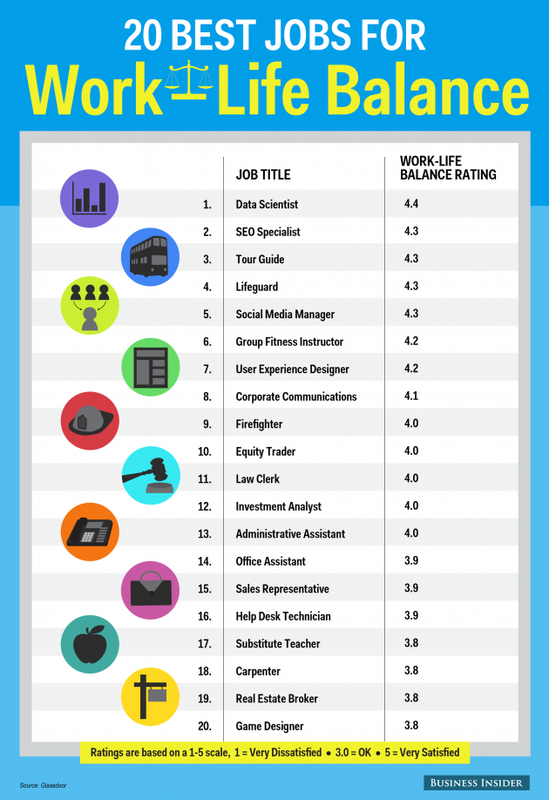 The top five careers on their list offer a bit of insight into what people might be looking for in work-life balance. Three of the top five are careers that may offer remote work opportunities or flexible hours: data scientist, SEO specialist and social media manager. Two others in that top five, tour guide and lifeguard, can be personally rewarding for people who really love that type of job.